Capstone assignment is a written academic work that is conducted during the final year of study, or at the end of a particular course of learning. Such kind of an individual work can take many forms, depending on the requirements, approved by an educational establishment, and curriculum peculiarities. Capstone assignment is a very important kind of work for students as its results reveal the level of their proficiency in major and enable them to demonstrate all acquired skills within a particular area of specialization. This type of academic essay significantly influences the final grade and presupposes an implementation of a substantial research and demonstration of a critical thinking regarding some problem, being relevant to the fieldwork experience. 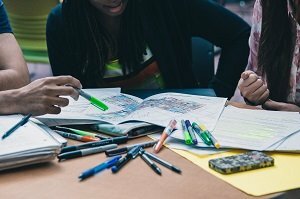 One of the unique features of this kind of work it that involves resolution of a particular problem that pertains to students’ future professional activity. Accordingly, a successful implementation of the capstone assignment requires a profound knowledge of the subject field. There are no strictly envisaged rules regarding the process of writing of the capstone assignment, as a demonstration of proficiency in different courses of study can vary in methods and procedures. It also stems from the fact that capstone assignments are interdisciplinary in nature as their fulfillment requires a multi-aspect analysis of the problem under consideration that includes its surveying from various perspectives and approaches. Students should demonstrate creative decision-making actions and prove all achieved results and conclusions with reliable data. Capstone projects are intrinsic parts of major programs as their multifaceted nature facilitates students’ professional development, objective evaluation of a studied phenomenon, and mastering of both practical and theoretical skills. Conduction of such a work presupposes a completion of multiple tasks that define a considerable educational significance of the capstone assignment. Every student personally selects a theme of a capstone assignment, having an opportunity to investigate the problems that pertain to his or her sphere of interests within the course program. Accordingly, a creative nature of this type of individual project along with students’ potential interests in its conduction promotes their active engagement in work on the assignment and investigation of new information within the subject field. A scrutinized analysis and a clear identification of various tasks that relate to future career responsibilities facilitate students to learn more about their professional duties, reveal the peculiarities of the working process, and allocate a significant practical experience. A better awareness of such issues provides students with better career opportunities and induces their aspirations to implement all obtained knowledge and experience in practice. The aggrandizement of Students’ Self-Confidence and Self-Esteem. Implementation of the capstone assignment is quite a complicated task as students have to conduct many independent studies and take on new responsibilities. Due to an absence of any previous experience in such academic activity, the fact of its successful completion increases students’ self-reliance. Moreover, a fulfillment of similar assignments facilitates their further aspirations to conduct complicated researches as multi-task projects. Increasing of Proficiency in the Subject Field. The capstone assignment serves as a proof of students’ competence; sequentially, its successful completion requires a sufficient knowledge of the course program. In addition, an exploration of the selected theme of the project involves a scrutinized analysis of all phenomena that were previously studied at lectures and practical lessons.